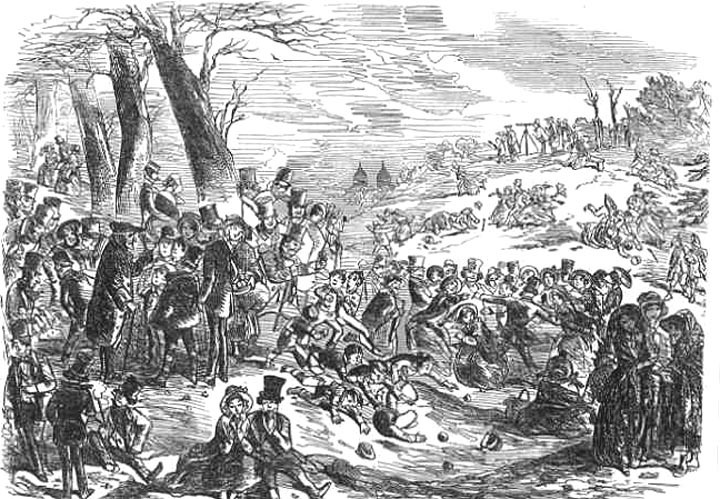 "Greenwich Fair" Chapter 12 in "Scenes," by Charles Dickens in Sketches by Boz, originally published on 16 April 1835; illustration facing p. 86. The grandest and most numerously-frequented booth in the whole fair, however, is "the Crown and Anchor" — a temporary ball-room — we forget how many hundred feet long, the price of admission to which is one shilling. Immediately on your right hand as you enter, after paying your money, is a refreshment place, at which cold beef, roast and boiled, French rolls, stout, wine, tongue, ham, even fowls, if we recollect right, are displayed in tempting array. There is a raised orchestra, and the place is boarded all the way down, in patches, just wide enough for a country dance. There is no master of the ceremonies in this artificial Eden — all is primitive, unreserved, and unstudied. The dust is blinding, the heat insupportable, the company somewhat noisy, and in the highest spirits possible: the ladies, in the height of their innocent animation, dancing in the gentlemen's hats, and the gentlemen promenading "the gay and festive scene" in the ladies' bonnets, or with the more expensive ornaments of false noses, and low-crowned, tinder-box-looking hats: playing children's drums, and accompanied by ladies on the penny trumpet. The noise of these various instruments, the orchestra, the shouting, the "scratchers,"​and the dancing, is perfectly bewildering. The dancing, itself, beggars description​—​every figure lasts about an hour, and the ladies bounce up and down the middle, with a degree of spirit which is quite indescribable. As to the gentlemen, they stamp their feet against the ground, every time "hands four round"​begins, go down the middle and up again, with cigars in their mouths, and silk handkerchiefs in their hands, and whirl their partners round, nothing loth, scrambling and falling, and embracing, and knocking up against the other couples, until they are fairly tired out, and can move no longer. The same scene is repeated again and again (slightly varied by an occasional "row") until a late hour at night: and a great many clerks and​'prentices find themselves next morning with aching heads, empty pockets, damaged hats, and a very imperfect recollection of how it was they did not get home. — "Scenes," Chapter 12, "Greenwich Fair," p. 87. Of late, as the following excerpts from recently published articles aver, the​raucous riverside bacchanal has made something of a comeback at Greenwich, albeit as a somewhat more "family friendly" event ("tumbling" does not apparently meet the standards of modern "risk-assessment"). At the original fair, abandoned in 1857 perhaps because of its unVictorian licentiousness and partly because of its sheer numbers (which must have rendered policing as problematic as any kind of law enforcement at Woodstock in our own era), the chief attractions were gaily lit vendors' stalls (selling prepared food, nicknacks, toys, and cigars), bands, wild-beast shows, and the twenty-five-minute show at Richardson's temporary theatre (featuring a melodrama, a pantomime, a comic song, and "incidental music"), and the temporary ballroom of "The Crown and Anchor" (a name acknowledging the maritime heritage of the borough). What would one give to be transported back in time to experience Greenwich Fair at its giddy height? As it gathered force in the early 19th century — having begun life, judging by earliest mentions, a century earlier — it prompted visitors of a literary disposition to reach for their pens in wonder. Dickens plainly adored the multitudinous spectacle that seized Greenwich every Easter and Whitsun. In Sketches by Boz (1836)​ . . . .
Greenwich Fair was closed down, upon petition to the Home Secretary, in 1857; it had become too teeming (visitor numbers in excess of 200,000) and too debauched for the better-heeled locals. But this coming weekend, it will be bornagain, as part of the​Greenwich and Docklands International Festival 2011. . . . .
What he can't do is wave a wand, undo "progress", and allow today's youth to go hurtling downhill from the top of Observatory Hill en masse, endangering life and limb — "We can't risk-assess that, "he jokes. Gone are the naval pensioners, who'd​ tell hair-raising tales and — for a penny a pop —​offer peeks through their telescopes of the Isle of Dogs gibbet, where rotting pirate corpses would hang. Gone, too, is the notorious Crown and Anchor dancing-booth, in which cross-dressing and all kinds of transgressive carry-on would take place; and Richardson's, a travelling theatre​ . . .​ — Dominic Cavendish. Hawkers, sideshows, wax works, lurid theatrical entertainments — there were booths for anything the partying cockney could want, and as the years went on, the upper classes left them to it more and more. They could get a tooth pulled or watch a prize fight. They could buy a trinket or dance a quadrille. They could hear a trumpet voluntary or get their fortunes told, watch wild beasts fight or drink a barrel of beer. They could visit Wombwell's Menagerie or any one of the dozens of alehouses on the Thames. They could 'meet'​a nice young lady and if they were really getting on, that they could engage in a spot of tumbling together. He could even get himself a Scratcher to tease her with. (no — ​ not some strange marital aid —​it was little serrated wheel on a stick which you rolled up and down your victim's back. The noise it made sounded as though you'd ripped their clothes. Hilarious. )​ — The Greenwich Phantom — An Intimate Guide to Life in Greenwich. George Cruikshank probably read the periodical version of the journalistic sketch in The Evening Chronicle for 16 April 1835 under the title "Sketches of London No. 9" by the suddenly popular "Boz" even before he received the commission to illustrate the First Series in volume form. The essay must have given him a wealth of material for visual interpretation — booths, animal shows, popular theatre, and "tumbling" down the hill — so that one may assume that in producing the present illustration Cruikshank received some input from young Dickens himself. to the left, a young man cavorts in a lady's bonnet while his partner, right of centre, is apparently wearing his top-hat. Several young men are wearing false noses, as if they were participants in an Italian festival, and musicians play dance-tunes (upper left) for the young men and women under the illumination of small garden lights set in a chandelier, presumably hanging from the improvised ceiling. The clouds of smoke upper right and left imply large-scale smoking of cigars by the male dancers. 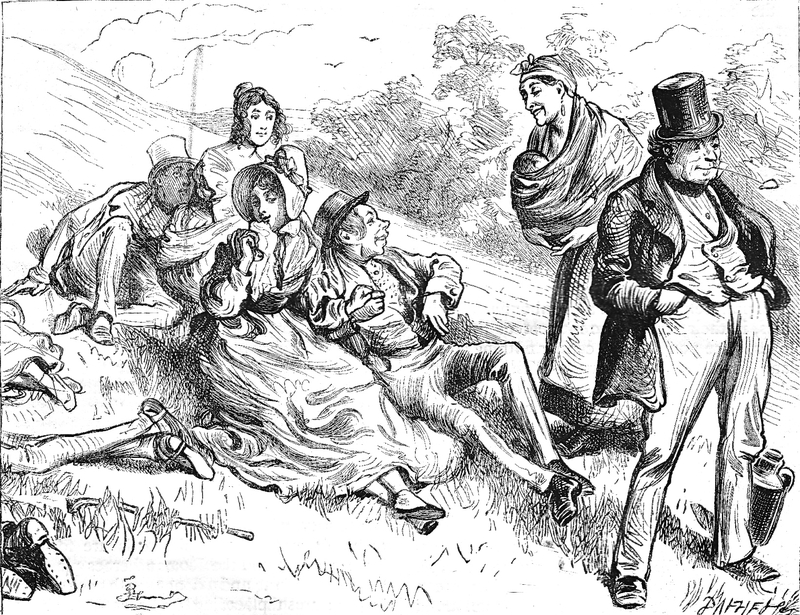 The 21 May 1853 Illustrated London News illustration by Phiz, who replaced Cruikshank as Dickens's chief illustrator, shows the innocuous afternoon entertainments, and features in the lower left a Greenwich Naval Pensioner's offering to conduct a guided tour of lurid local scenes in Whitsuntide at Greenwich Park (detail) while on the hill (upper right) while another such retiree offers to show "interesting sights" through a telescope. 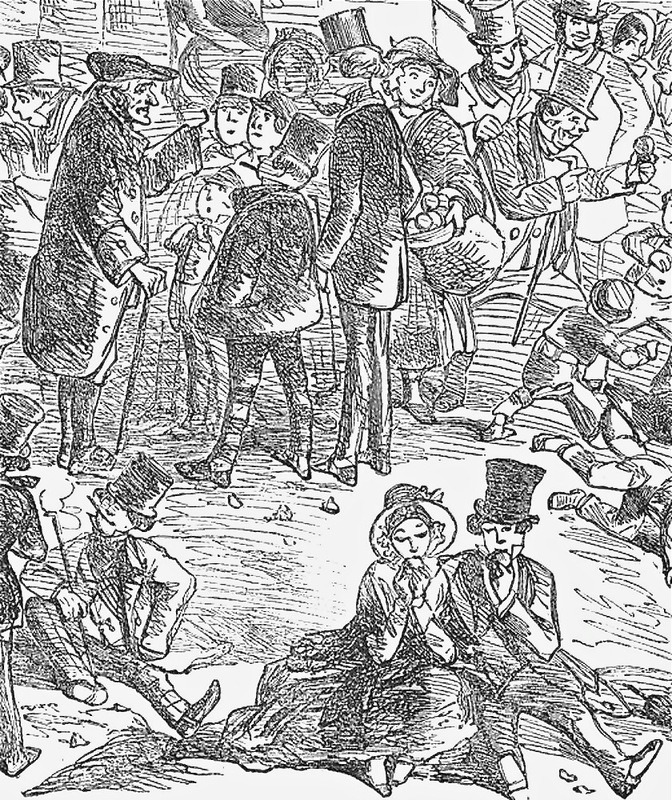 The Cruikshank illustration, which is comparable in its specificity if not to its subject matter to that which appeared in the Illustrated London News, seventeen years later, suggests that Dickens's original illustrator had actually studied Greenwich Fair on the spot one Easter, although the date of publication preceded Whitsun in 1836, suggesting that the sketch (stimulated by Dickens's essay) is either of an earlier date or done from vivid memory. 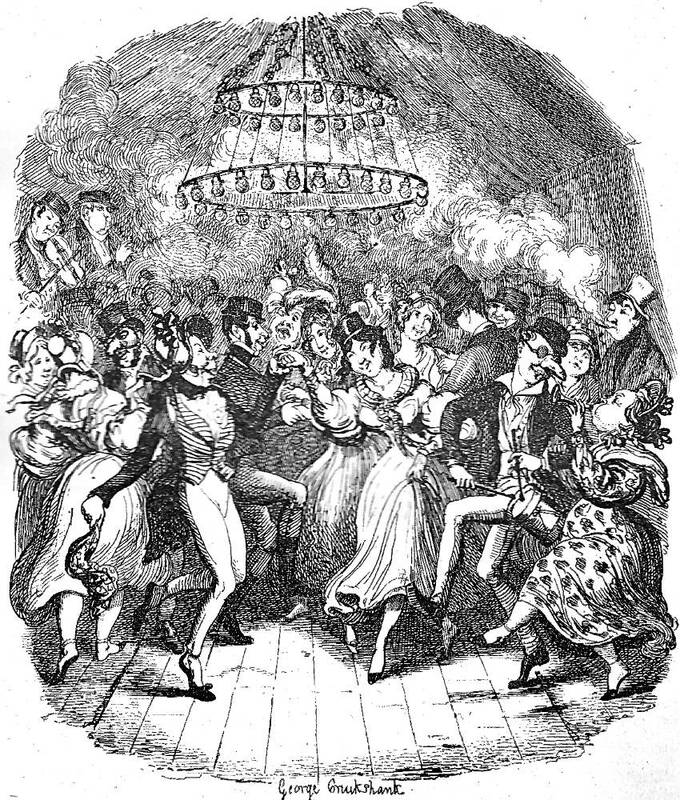 Since the fair in the evenings was something of a bacchanal, in his younger days Cruikshank may have even been a participant, but would as a thorough Londoner have known of the "night side" of the fair as well as its more "family friendly" afternoon scenes captured by Phiz in 1853 and Barnard in 1876. During the following year (1837) Macrone published a Second Series of the "Sketches" in one volume, uniform in size and character with its predecessors, and containing ten etchings by Cruikshank; for the second edition of this extra volume two additional illustrations were done, viz., "The Last Cab-Driver" and "May-day in the Evening." It was at this time that Dickens repurchased from Macrone the entire copyright of the "Sketches," and arranged with Chapman & Hall for a complete edition, to be issued in shilling monthly parts, octavo size, the first number appearing in November of that year. The completed work contained all the Cruikshank plates (except that entitled "The Free and Easy," which, for some unexplained reason, was cancelled) and the following [twelve] new subjects: "The Parish Engine," "The Broker's Man," "Our Next-door Neighbours" [sic], "Early Coaches," "Public Dinners," "The Gin-Shop," "Making a Night of It," "The Boarding-House," "The Tuggses at Ramsgate," "The Steam Excursion," "Mrs. Joseph Porter," and "Mr. Watkins Tottle." . . . . The alteration in the size of the illustrations for this cheap edition necessitated larger plates, so that the artist was compelled to re-etch his designs. These reproductions, although on an extended scale, were executed with even a greater degree of finish, and contain more "colour" than those in the first issue; but the general treatment of the smaller etchings is more pleasing by reason of the superior freedom of line therein displayed. As might be anticipated, a comparison of the two sets of illustrations discloses certain slight variations, which are especially noticeable in the following plates: "Greenwich Fair;" musicians and male dancer added on left. — F. G. Kitton, "George Cruikshank," p. 4-5. Dickens, Charles. "Greenwich Fair," Chapter 12 in "Scenes," Sketches by Boz. Illustrated by George Cruikshank. London: Chapman and Hall, 1839; rpt., 1890. Pp. 81-87. Dickens, Charles. "Greenwich Fair," Chapter 12 in "Scenes," Sketches by Boz. Illustrated by Fred Barnard. The Household Edition. London: Chapman and Hall, 1876. Pp. 115-56. Dickens, Charles. "Greenwich Fair," Chapter 12 in "Scenes," Sketches by Boz. Illustrated by Harry Furniss. The Charles Dickens Library Edition. London: Educational Book Company, 1910. Vol. 1. Pp. 104-112. "Greenwich Fair." The Greenwich Phantom — An Intimate Guide to Life in Greenwich.​Accessed 13 April 2017.​ http://www.thegreenwichphantom.co.uk/2008/05/greenwich-fair/. Phiz (Hablot Knight Browne). "Whitsuntide in Greenwich Park." Illustrated London News. 21 May 1853. P. 408.